Wing span: 1/2 - 3/4 inch (1.2 - 2 cm). Identification: Tiny. 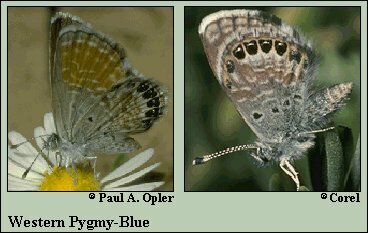 Upperside copper brown with dull blue at the bases of both wings. Underside of hindwing is copper brown with white at the base; fringe mostly white; 3 small black spots near base; row of black spots at outer margin. Life history: Males patrol over the host plants all day to find receptive females. Females lay eggs all over the host but particularly on the uppersides of leaves. Caterpillars eat all parts of the plant. Chrysalids hibernate. Flight: July-September in the north, all year in South Texas. Caterpillar hosts: Pigweed (Chenopodium album), saltbush species (Atriplex), and others in the goosefoot family (Chenopodiaceae). Habitat: Alkaline areas such as deserts, salt marshes, and wasteland. Range: Common. Central California east to southern Nevada, central Arizona, central New Mexico, and west Texas. South through southern California, Baja California, and Mexico to Venezuela. Migrates to Arkansas, Nebraska, and Oregon.